HUSSON (ARG) (Chestnut 2003-Stud 2007). 5 wins to 1600m, San Isidro G.P. Raul y Raul E Chevalier, Gr.1. Sire of 398 rnrs, 254 wnrs, 15 SW, inc. Lucky Hussler (MVRC William Reid S., Gr.1), Frolic, Moral Victory, Russon, Sabat Husson, Boganaire - Obrigado Mais (Mac. ), Lady Hussy, Nothingilikemore, First Crush, Husson Eagle, Raido, The Huntress, Affable, Hussousa, Peron, SP Looks Like the Cat, Miss Husson, Sister Souss, Ferment, Hi Son, etc. Bromes (g. by Big Brown). 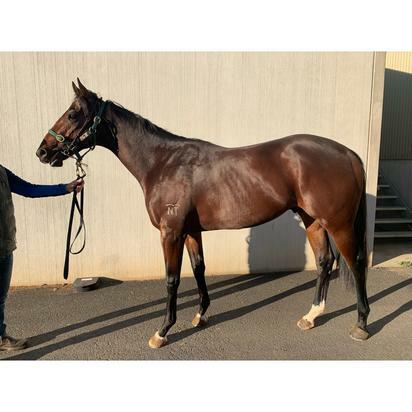 Winner at 1100m in 2018-19 in Aust. Tempt (g. by Congrats). Placed at 3 in 2017-18 in Aust. KHEMOSABI (Commands). 8 wins at 1400m, 1600m, NZ$182,000, A$21,980, Taranaki RC Opunake Cup, L, Hawkes Bay Master Plumbers H., AJC New Season H., ARC Tip Top Choc Bar H., CJC Brackenfield Hunt H., Waikato RC Priscott Racing Stables H., 2d ARC Apprentice of the Year H., Avondale JC Auckland Co-Op Taxis H., Waikato RC Windsor Park Stud H., Te Aroha JC Towes Insurance Brokers H., 3d CJC Winter Cup, Gr.3, Waikato RC Norris Ward McKinnon H., AJC Book Your Spring Carnival H., Waikato RC Beatson Stables H., 4th Marton JC Metric Mile, Gr.3, Avondale JC Karaka Classic, L.
Zyzxx (Danehill). 4 wins to 1400m, A$151,330, MRC South Australia A Brilliant Blend P., 2d VRC True Version H., Slickpix Silver Bowl Heat, MRC Bert Bryant H., 3d MRC JRA S., L, 65 Roses Victoria Cup. Mesmerize Me. 2 wins. See above. Metallic Grey. 3 wins to 1300m, 3d MRC Catanach's Jewellers 2YO H., SAJC Spring Gully H., ATC Pluck at Vinery H.
Misty Grey. Winner at 1000m in Aust. Secondary Force. Winner at 1200m in South Africa. Imanui. 4 wins at 1200m, 1600m, A$160,360, to 2018-19, ATC Theraces H., 2d ATC Star Club H., Rydges Parramatta H., 3d ATC TAB H., Huawei H., Tab.com.au H., Mick Stanley H.
GEORDOBA (Cordoba). 10 wins. See above. VILLANDRY (Var). 7 wins-4 at 2-at 1000m, 1200m, R772,325, Scottsville Gold Medallion S., Gr.1, Clairwood Godolphin Barb S., Gr.3, Kenilworth Summer Juvenile S., L, Fairview Fairview Merchants H., Soccer 6 S., Arlington Racing Association H., 2d Kenilworth Merchants S., Gr.2, Fairview Soccer 6 S., 3d Kenilworth Sign a Rama H., 4th Scottsville Umkhomazi S., Gr.2. Sculptor (Model Man). 5 wins to 1400m, R269,125, Arlington Emerald Cup Day H., 2d Fairview East Cape Sprint Cup, L, Feature Races at Turffontein H.
PAINTED GLORY (Del Sarto). 6 wins from 1400m to 2400m, Greyville Lonsdale Stirrup Cup, Gr.3. GLOWING THATCH (Golden Thatch). 8 wins-1 at 2-at 1000m, R198,030, Kenilworth UTA H., L, Milnerton Festival Flying 1000, L, 2d Milnerton Gordon Kirkpatrick Memorial H., L, 3d Turffontein OK Sprint Trial H., L.
Pewter (Rakeen). 6 wins from 1600m to 2000m, R295,865, 3d Turffontein Allez France H., L, Clairwood KZN Chapter Challenge Final 2000 H., Scottsville Golden Horse KZN Chapter Challenge Final 2000 H. Producer. Lilium Regale (West Man). 2 wins-1 at 2-at 1600m, 2d Vaal Ruffian S., L. Producer. TRITON (West Man). 9 wins-5 at 2-to 1400m, R376,595, Fairview East Cape Nursery, L, Champion Juvenile Cup, L.
ARION (Silvano). 3 wins at 1400m, 1800m, R609,075, Kenilworth Peninsula H., Gr.2, 3d Kenilworth Cape Derby, Gr.1. BILBOA (Cordoba). 6 wins-1 at 2-from 1200m to 1800m, R593,817, Turffontein London News S., Gr.3, Scottsville Michael Roberts H., L, 2d Turffontein Drum Star S., L, 3d South African Derby, Gr.1. DAGMAR (Querari). 2 wins at 2, R286,063, in 2017-18, Turffontein Ruffian S., L, 2d Turffontein Pretty Polly S., Gr.3.